For the whole of its life, the Chestnut House will act as a power-station for the grid. The first 60 years of surplus energy can be seen as paying off its embodied carbon debt. The next 60 years of life will produce the zero-carbon energy needed to produce its eventual replacement building, and beyond that it's surplus energy can be seen as a zero-carbon energy contribution to the other needs of society. Our collaboration with the Prince of Wales’ Foundation for Building Community produced an unostentatious, low cost, low carbon, timber-framed Passive House design for rural communities. The geometries and proportional systems of traditional architecture were used to design both the exterior facades and the plans. The elevations are a traditional, finely detailed, but reserved design. Rental and market housing are indistinguishable from the street, and the designs are easily adaptable to suit any orientation or street pattern, because the houses will perform as a Passive House whatever way they face. Inside, building services strategies are tailored to the tenure of the house type; a simple, affordable gas combi boiler for the social housing model and an all-electric compact unit with a heat pump for the market house. 10m2 of photovoltaic panels on the roof of the market house provide the total annual power demand for both the ventilation and the heat pump. The design won the BRE international competition for a Passive House prototype at the Watford Innovation Park, but the BRE was unable to secure funding to build the winning design. 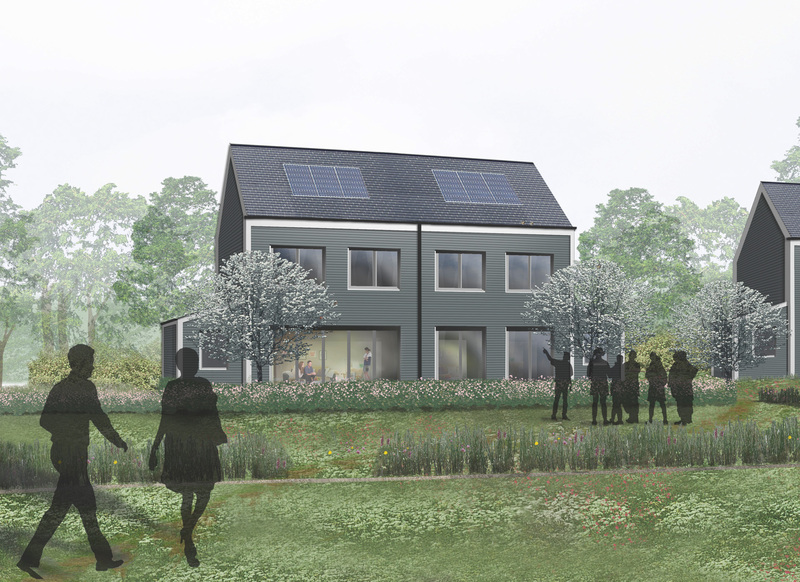 Our hugely comprehensive design proposal included a detailed technical examination of the house types, including a whole life costing analysis, a future climate change adaptation study, as well as advanced data linking techniques to the Passivhaus Planning Package (PHPP). The results of these examinations established that the Chestnut house had the opportunity in 2012 of becoming the UK’s first Zero-Zero Carbon dwelling, both in operational and embodied emissions. The Chestnut house is a cost effective, replicable yet technically refined house type with immediate roll out potential.